2" curved bottom graphite nut blank. 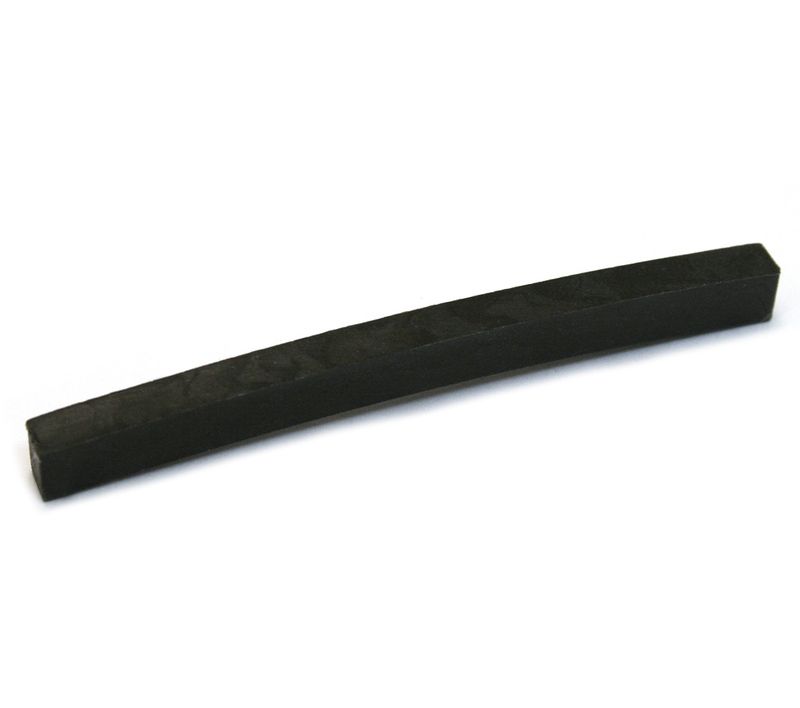 Great for replacement on 1-3/4" P Bass® necks and 5-string bass necks. Bone nut blank with flat bottom. Sized for Jazz Bass® and other narrow applications. Measures 1-9/16" x 1/4" x 1/8". 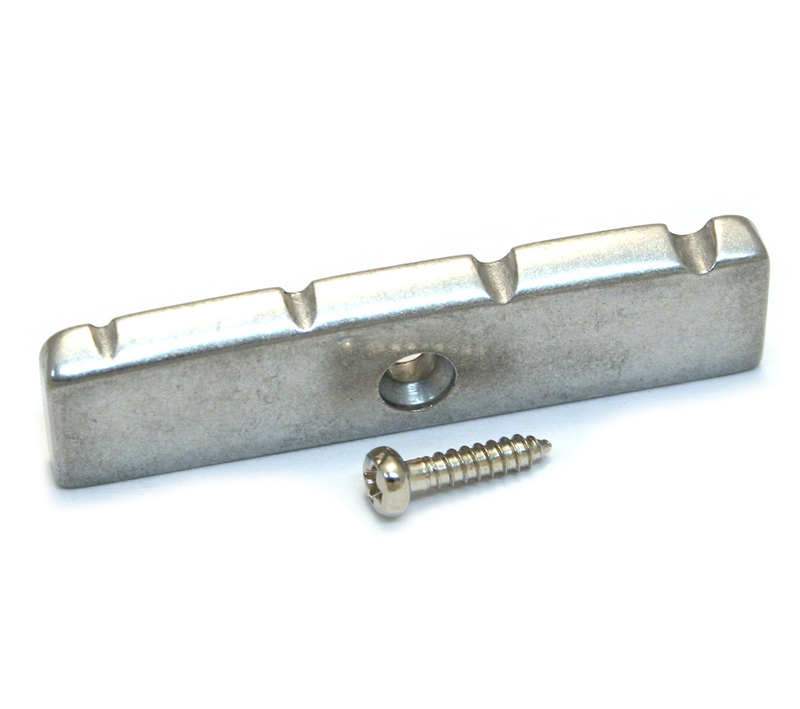 Aluminum Bass Nut, 4 string, 1-3/4" x 1/8" x 3/8". Includes screw. 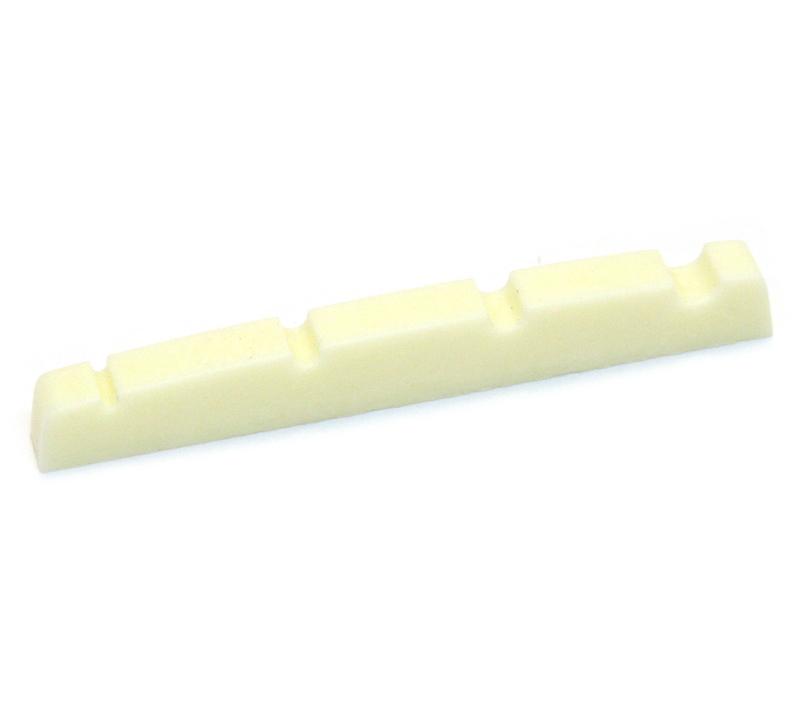 Pre-slotted cream plastic bass nut for J Bass® or similar models. Measures 1-1/2" x 1/8" x 7/32" tall with 1-1/8" string spacing. Flat bottom. 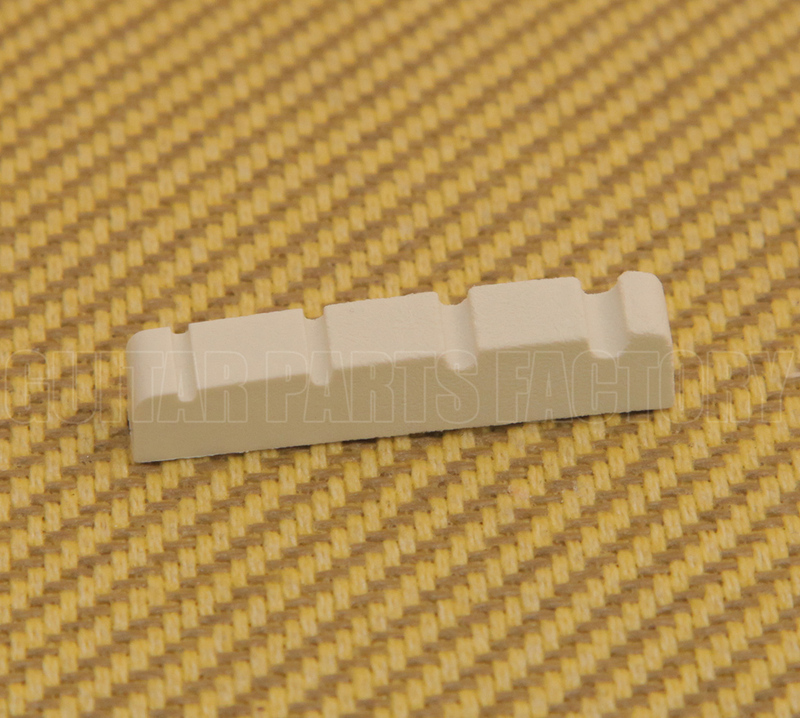 Pre-slotted cream plastic bass nut for P Bass® or similar models. Measures 1-5/8" x 1/8" x 7/32" tall with 1-5/16" string spacing. Flat bottom. 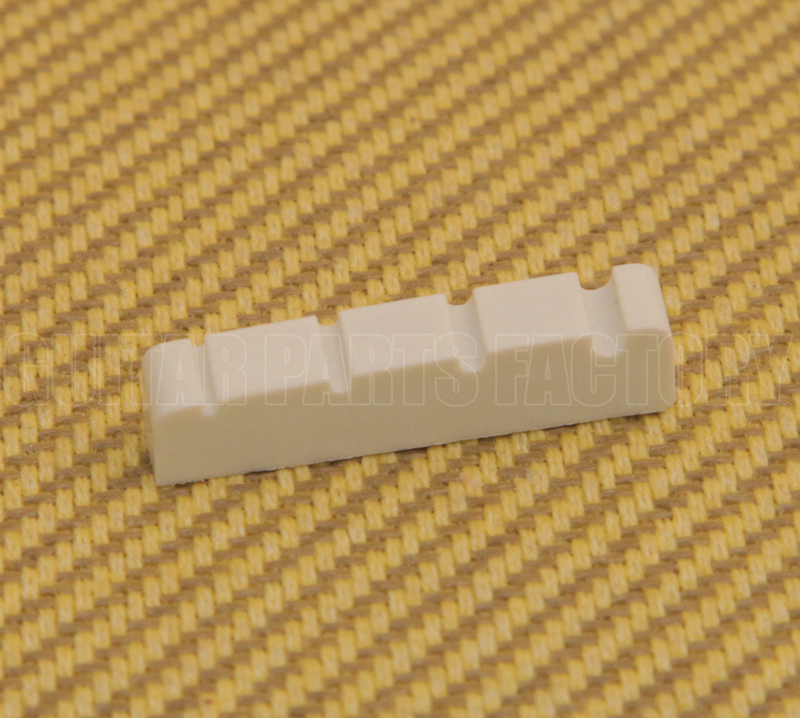 Pre-slotted cream plastic bass nut for P Bass® or similar models. Measures 1-5/8" x 1/8". Flat bottom. 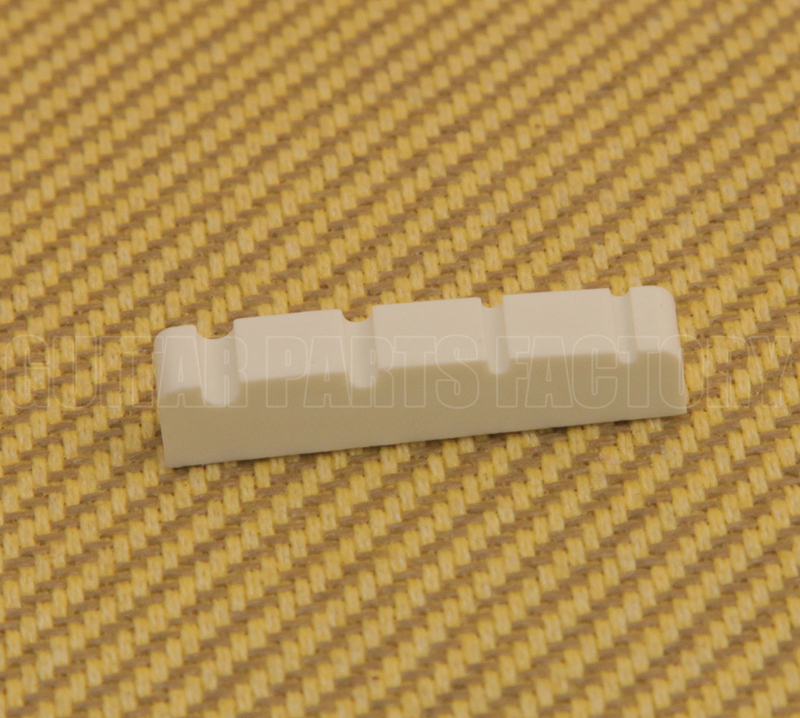 Pre-slotted white resonant plastic 4-string bass nut. 1-5/8" x 1/8". 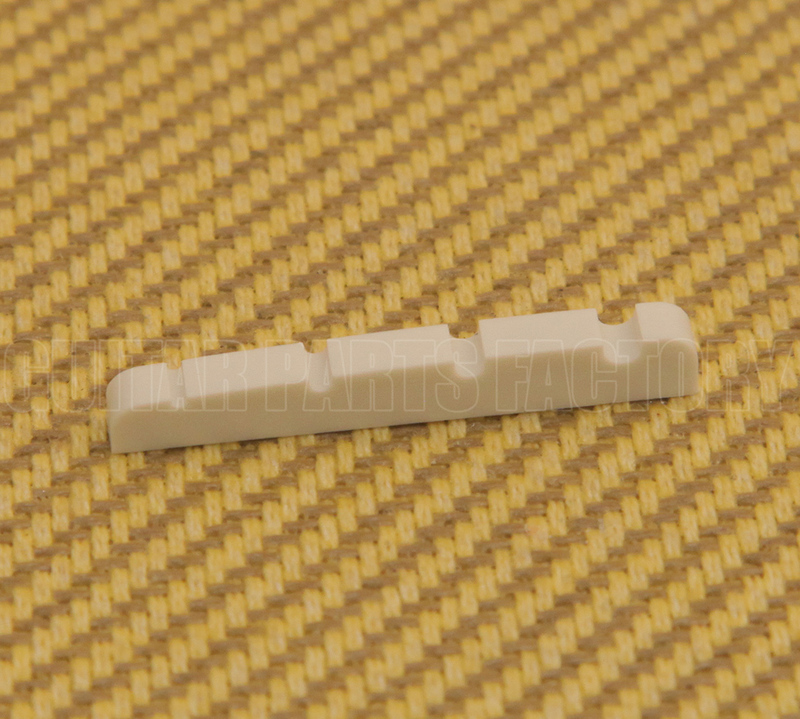 (1) slotted bone nut for P Bass®. Curved bottom. Measures 1-5/8" long x 1/8" slot x 11/32" tall. 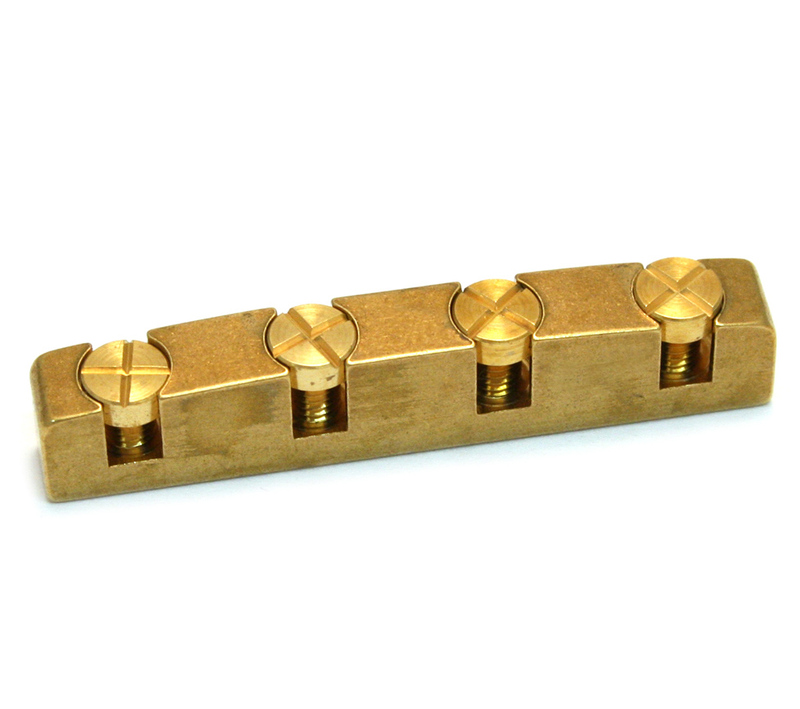 ABM adjustable brass nut for bass guitars with 3/16" nut slot. Measures 1-9/16" x 5/32" x 3/16". String spacing is 1-1/16". 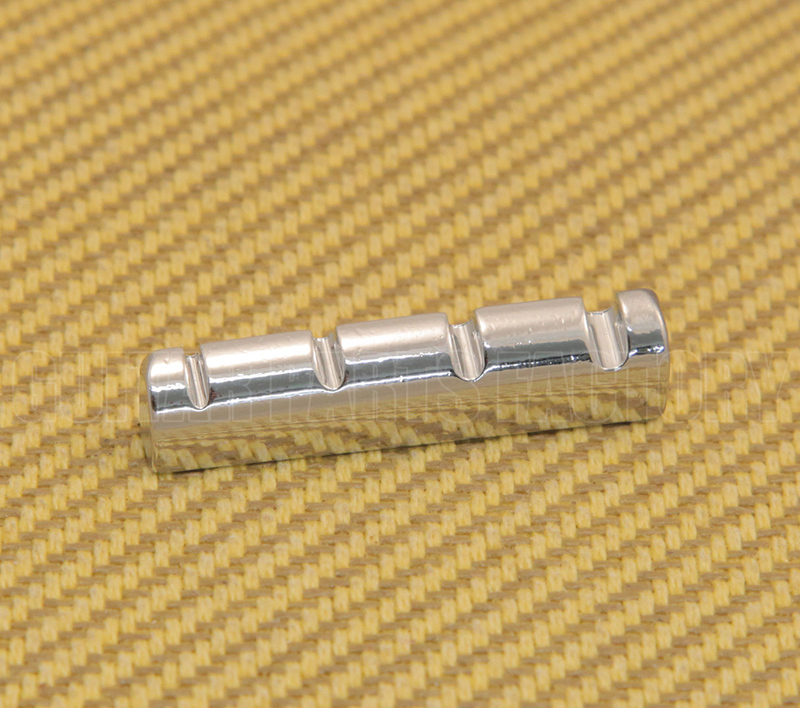 Aluminum nut for Danelectro® Longhorn bass. Includes one screw for mounting. 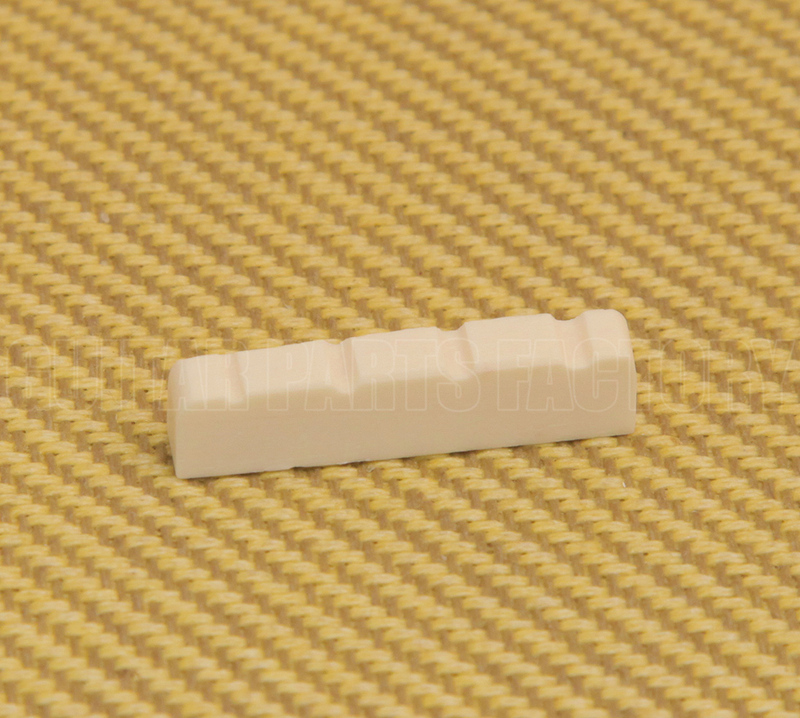 Approximately 41.7 x 3.25 x 9 mm. 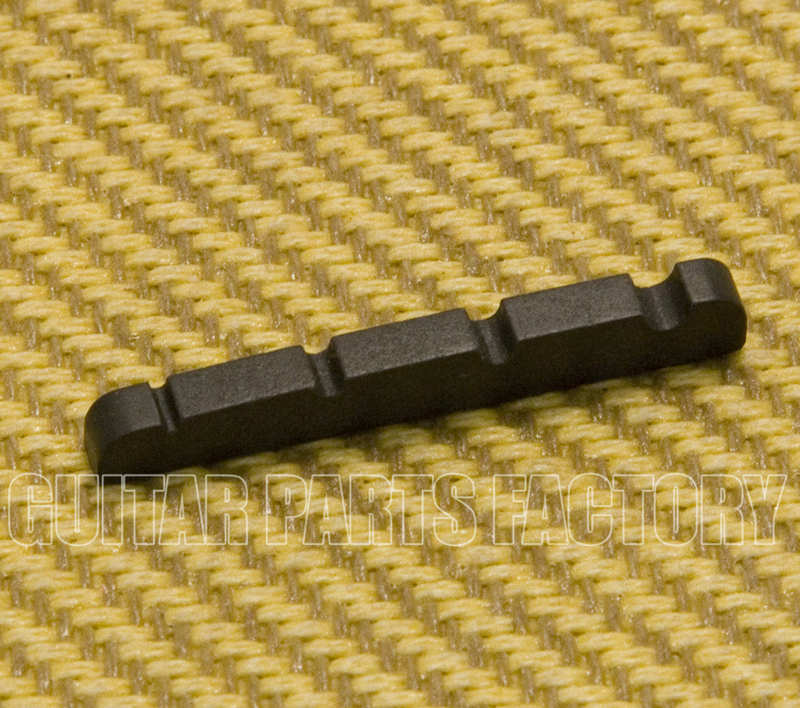 Pre-slotted graphite bass nut for J Bass® or similar models. Measures 1-1/2" x 1/8" x 7/32" tall with 1-1/8" string spacing. Flat bottom. 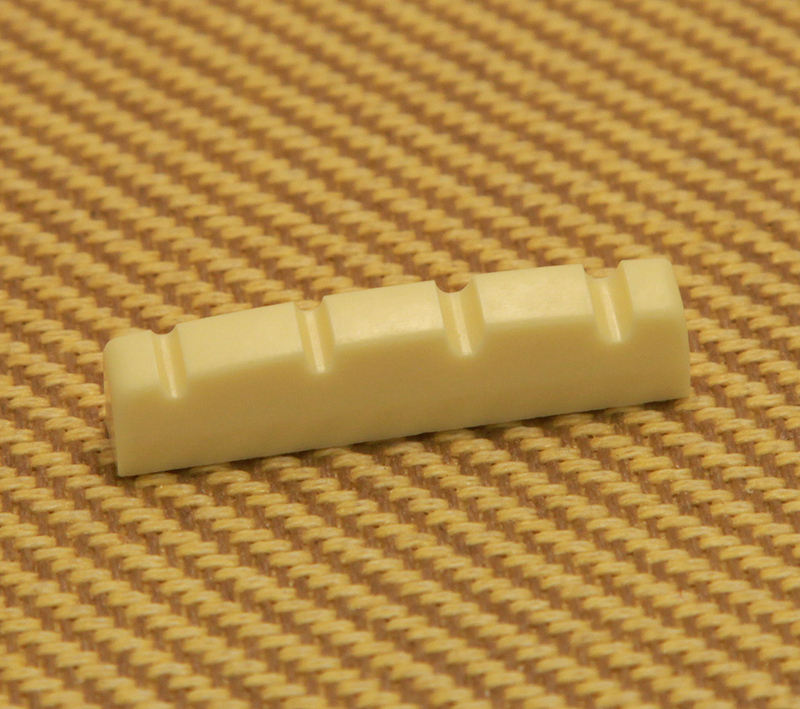 (1) slotted unbleached bone nut for Jazz Bass®. Curved bottom. Measures 1-9/16" long x 1/8" slot x 11/32" tall. 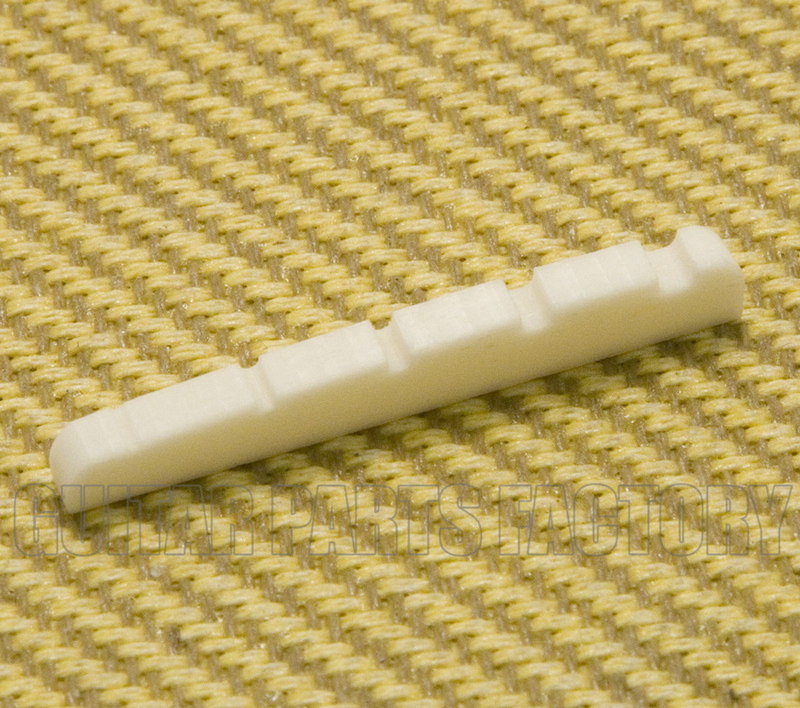 (1) Bone nut for Jazz Bass®, Curved with String Slots, 1-9/16" x 1/8" x 11/32". 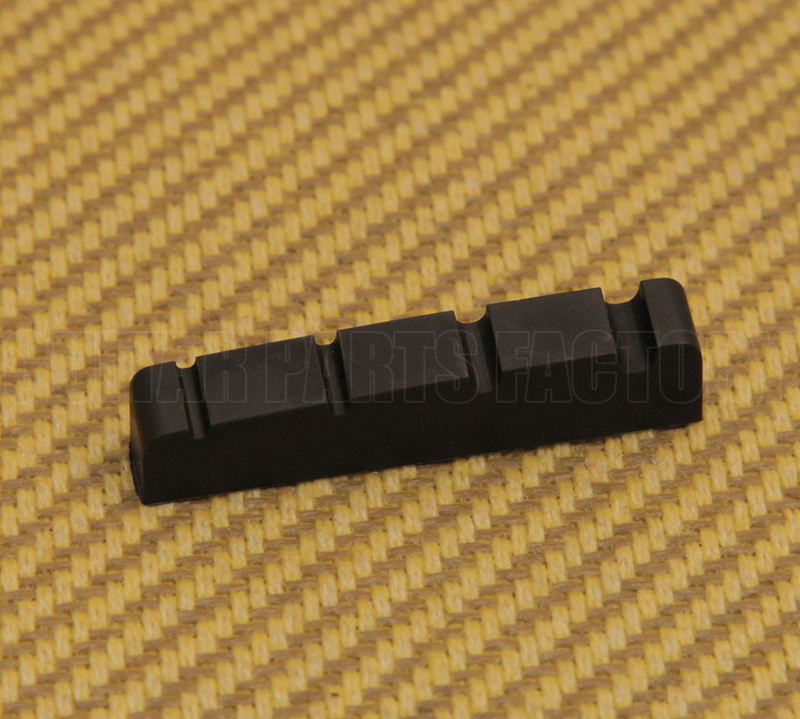 Pre-slotted black plastic bass nut for P Bass® or similar models. Measures 1-5/8" x 1/8" x 7/32" tall with 1-5/16" string spacing. Flat bottom. 4-string plastic nut for bass. 1.645 inches wide x 1/4 inch deep. 1 and 1/4 inch string spacing. (1) white graphite 4-string bass top nut with string slots. 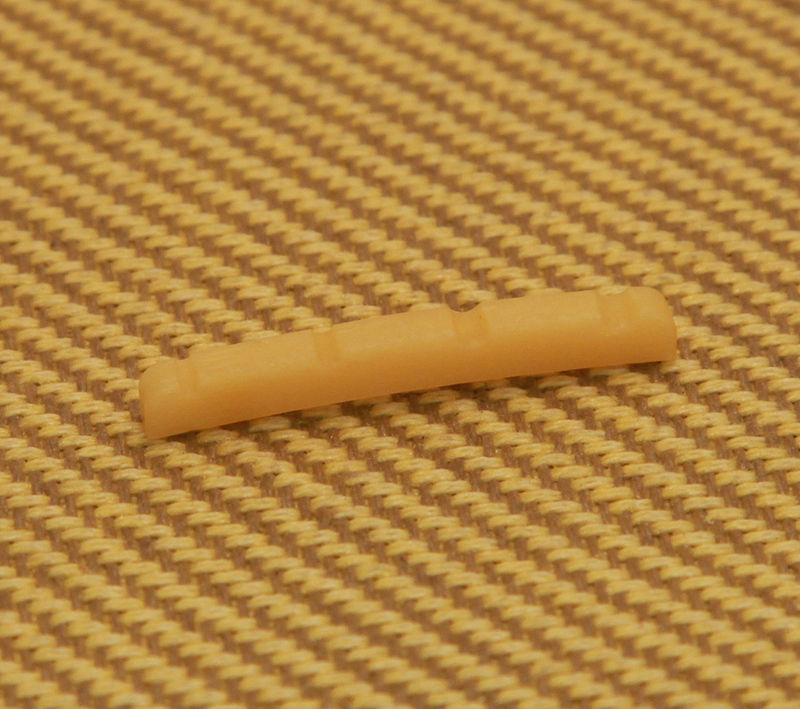 .139"(3.5mm) Length. .214"(5.5mm)High. 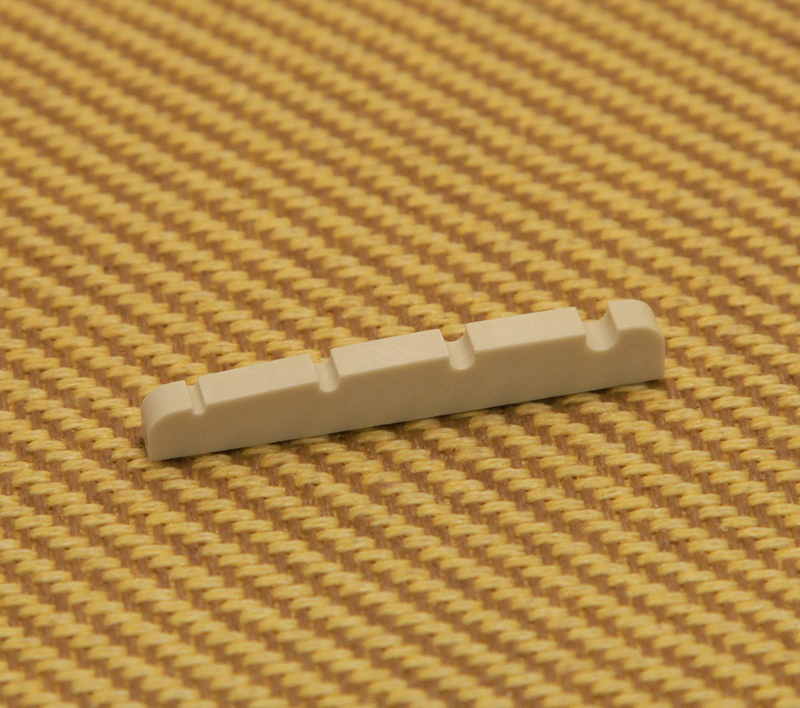 1.496" (38mm) Width. 1.120"(28.5mm) Overall String Spacing (center of 1 to center of 4). (1) white graphite 4-string bass top nut with string slots. .230"(5.9mm) Length. .369"(9.4mm)High. 1.490" (37.9mm) Width. 1.104"(28.0mm) Overall String Spacing (center of 1 to center of 4). (1) black graphite 4-string bass top nut with string slots. .230"(5.9mm) Length. .369"(9.4mm)High. 1.490" (37.9mm) Width. 1.104"(28.0mm) Overall String Spacing (center of 1 to center of 4). (1) black graphite 4-string P bass style bass top nut with string slots. 1.609" (40.9mm) Width. 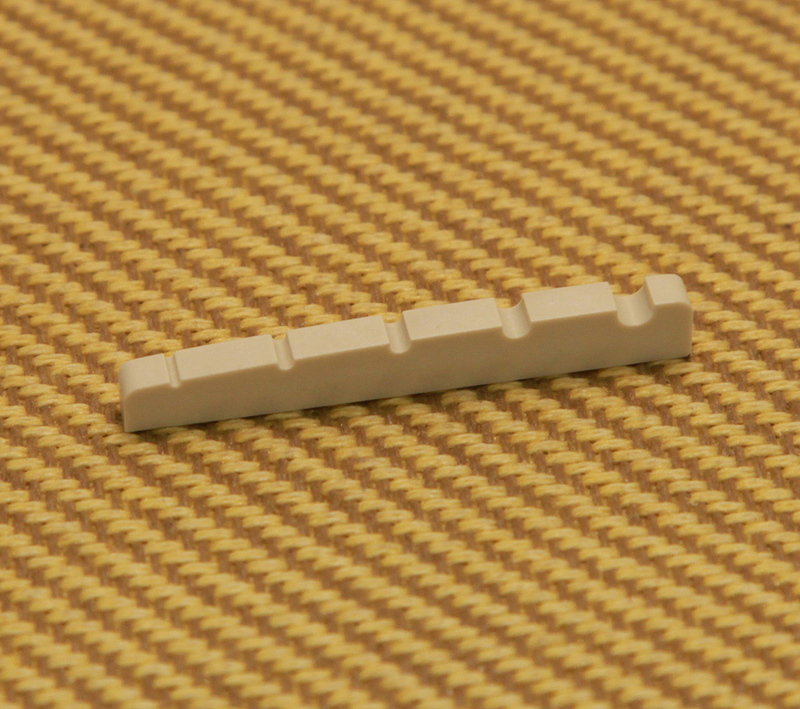 0.132"(3.4mm) Length. .230"(5.9mm)High. 1.219"(31.0mm) Overall String Spacing (center of 1 to center of 4). (1) white graphite 4-string bass top nut with string slots. 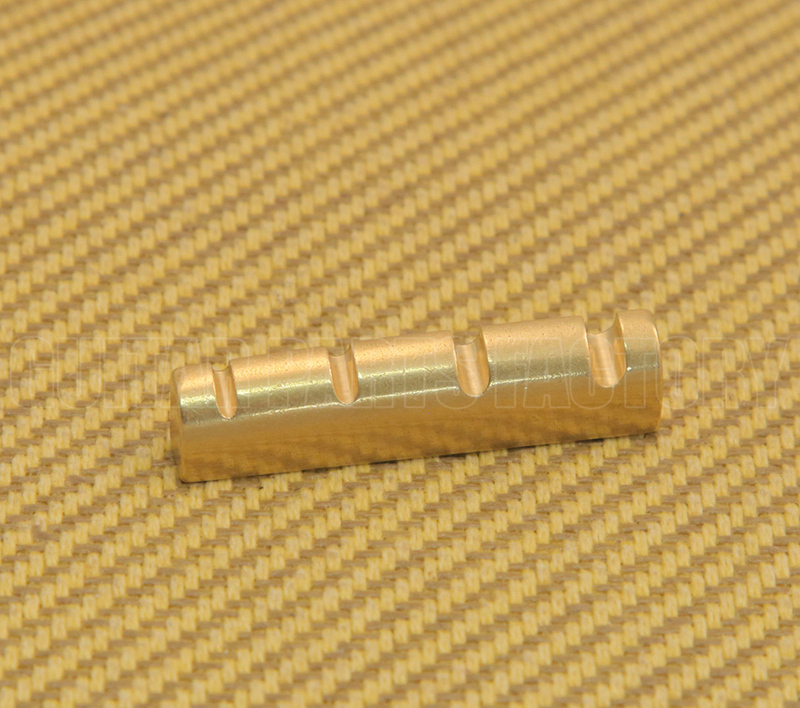 .236"(6.0mm) Length. .351"(8.9mm)High. 1.575" (40mm) Width. 1.207"(30.7mm) Overall String Spacing (center of 1 to center of 4). (1) black graphite 4-string bass top nut with string slots. 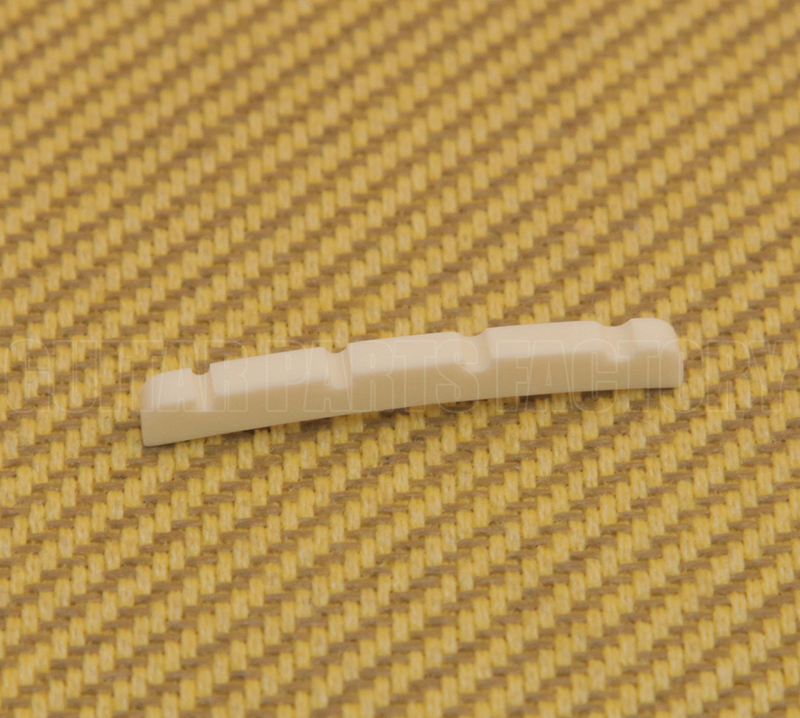 .236"(6.0mm) Length. .351"(8.9mm)High. 1.575" (40mm) Width. 1.207"(30.7mm) Overall String Spacing (center of 1 to center of 4). (1) Left-handed white graphite 4-string bass top nut with string slots. .225"(5.7mm) Length. .372"(9.5mm)High. 1.572" (39.9mm) Width. 1.210"(30.7mm) Overall String Spacing (center of 1 to center of 4). (1) Left-handed black graphite 4-string bass top nut with string slots. .236"(6.0mm) Length. .369"(9.4mm)High. 1.573" (40.0mm) Width. 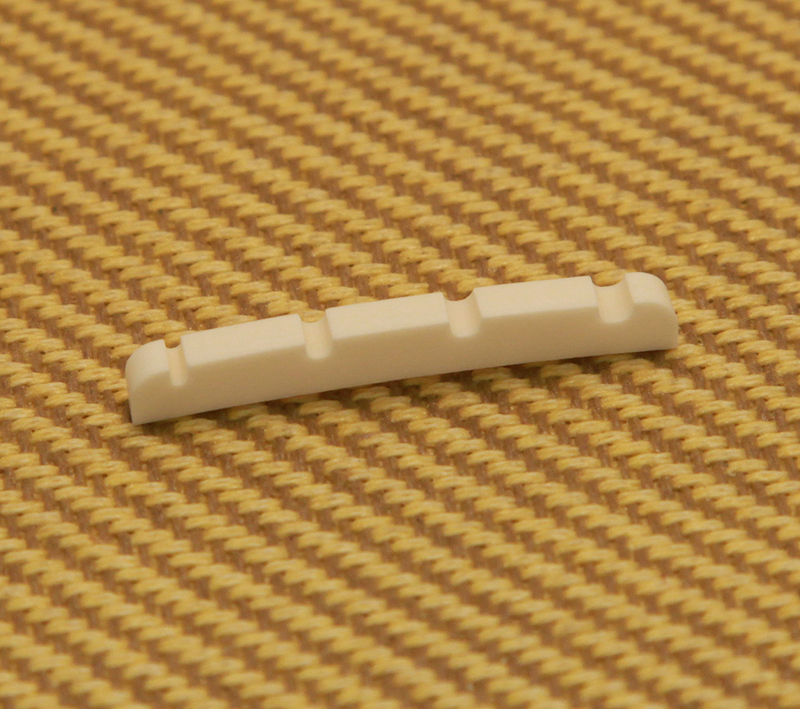 1.204"(30.6mm) Overall String Spacing (center of 1 to center of 4). 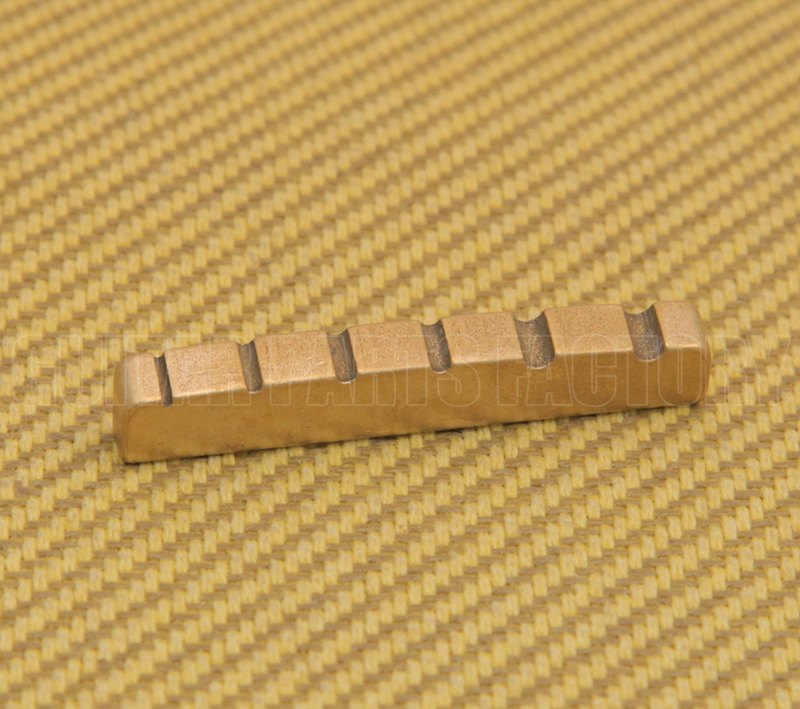 (1) slotted bone 4-string bass nut. 1.492" (37.9mm) Width; 0.235" (6.0mm) Length; 0.344" (8.7mm) Tall; 0.378" (9.6mm) String to String Spacing. (1) chrome-plated over brass 4-string bass top nut with string slots. 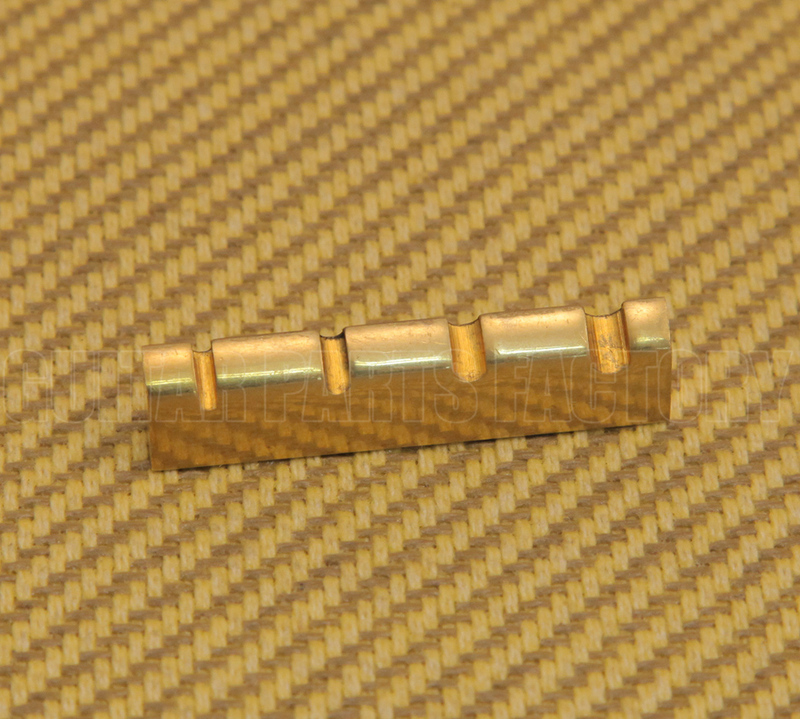 1.580" (40.1mm) Width. .224" (5.7mm) Length. .352" (9.0mm) Height. 1.180" (30.0mm) Overall String Spacing (center of 1 to center of 4). 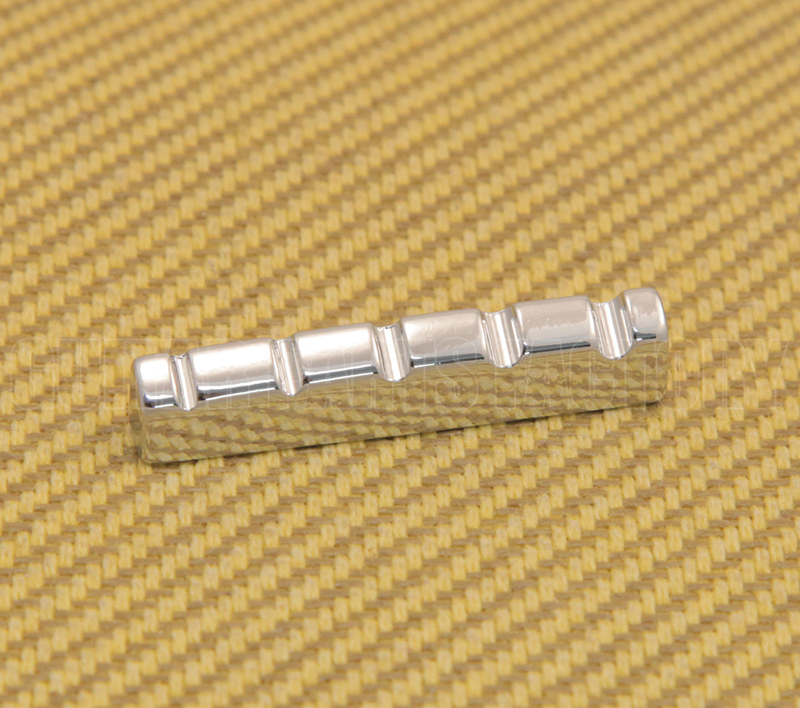 (1) polished chrome over brass 43mm 4-string bass top nut with string slots. 1.695" (43mm) Width; 0.240" (6.1mm) Thickness; 0.369" (9.4mm) Height; 1.334" (33.9mm) Overall String Spacing (center of 1 to center of 4). 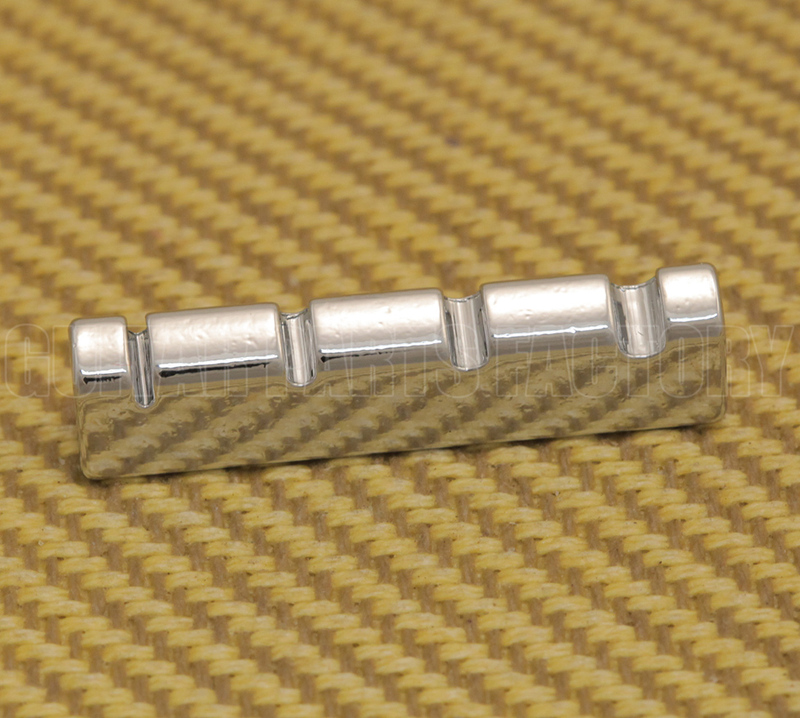 (1) polished chrome over brass 42mm 4-string bass top nut with string slots. 1.661" (42.2mm) Width; 0.240" (6.1mm) Thickness; 0.356" (9.1mm) Height; 1.176" (29.9mm) Overall String Spacing (center of 1 to center of 4). ((1) polished chrome over brass 5-string bass top nut with string slots. 1.784" (45.3mm) Width; 0.226" (5.7mm) Thickness; 0.357" (9.1mm) Height; 1.473" (37.4mm) Overall String Spacing (center of 1 to center of 5). 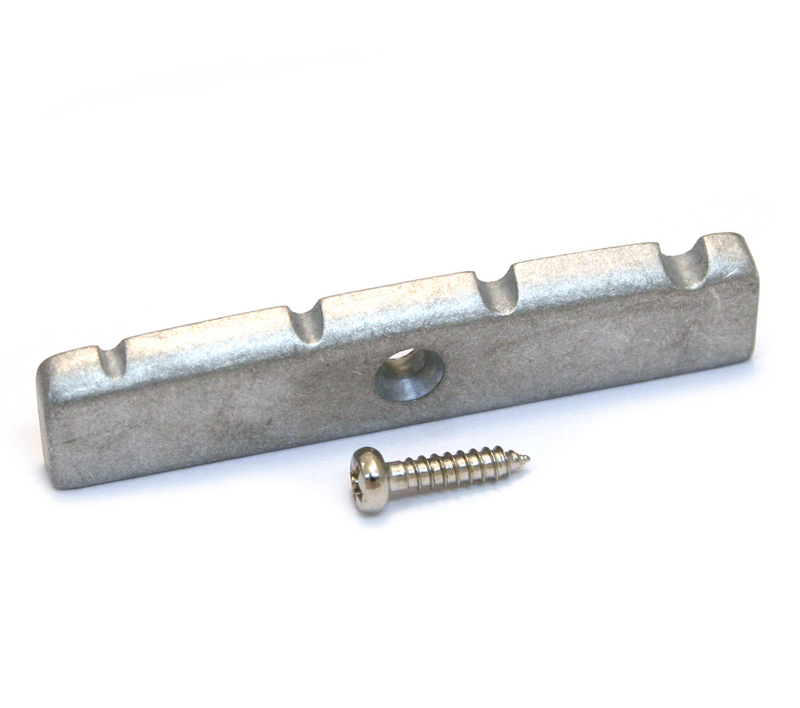 (1) heavy-duty brass 54mm 6-string bass top nut with string slots. 2.125" (54.0mm) Width; 0.237" (6.0mm) Thickness; 0.376" (9.6mm) Height; 1.719" (43.7mm) Overall String Spacing (center of 1 to center of 6). (1) Brass, 4-string bass nut, with string slots. Measures: 1.695" (43.1mm) W; 0.243" (6.2mm) L; 0.388" (9.9mm) High; 1.325" (33.7mm) OSS (Overall String Spacing, center of 1 to center of 4). (1) brass 4-string bass top nut with string slots. 1.572" (39.9mm) Width. .228" (5.8mm) Length. .353" (9.0mm) Height. 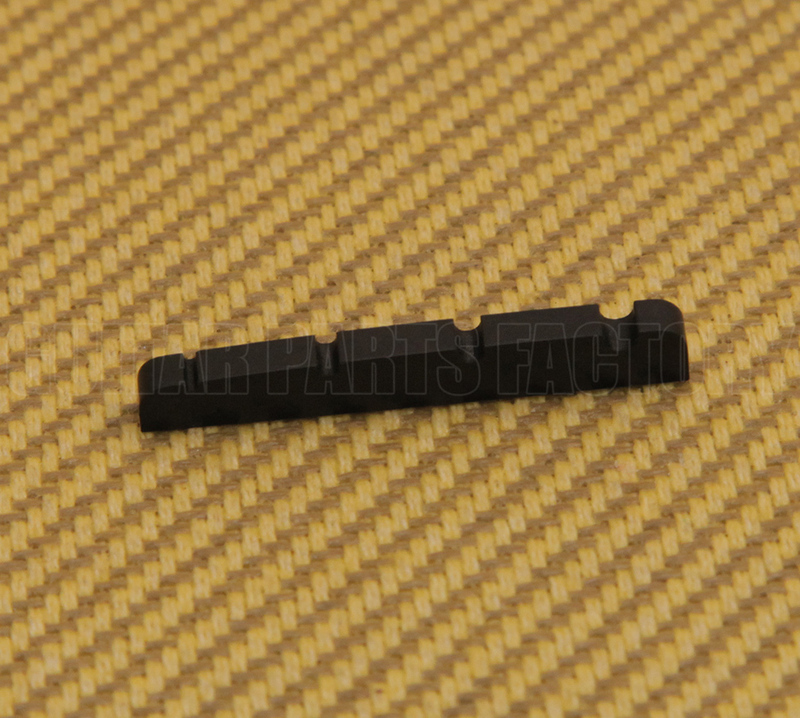 1.195" (30.4mm) Overall String Spacing (center of 1 to center of 4). 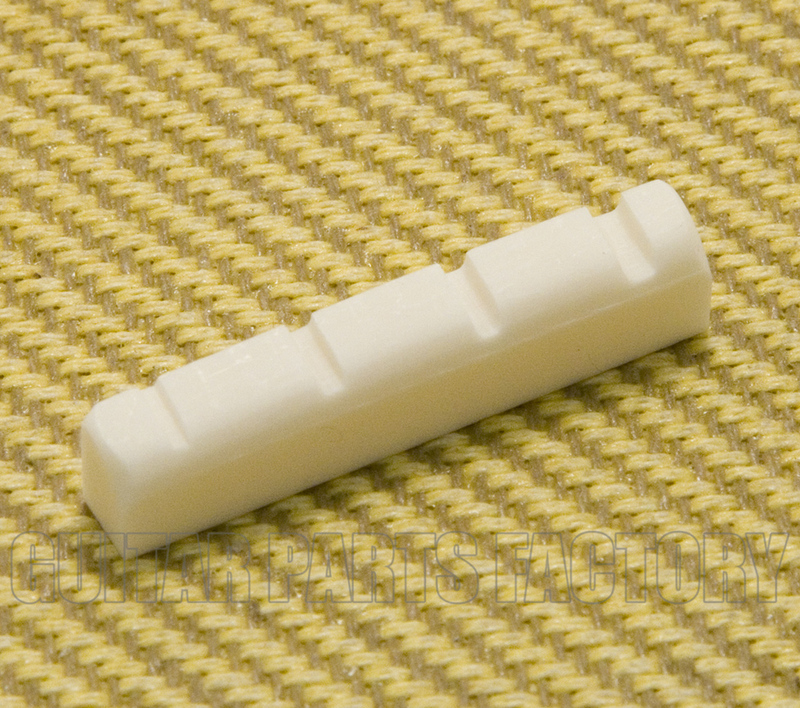 Pre-slotted white plastic 5-string resonant bass nut. 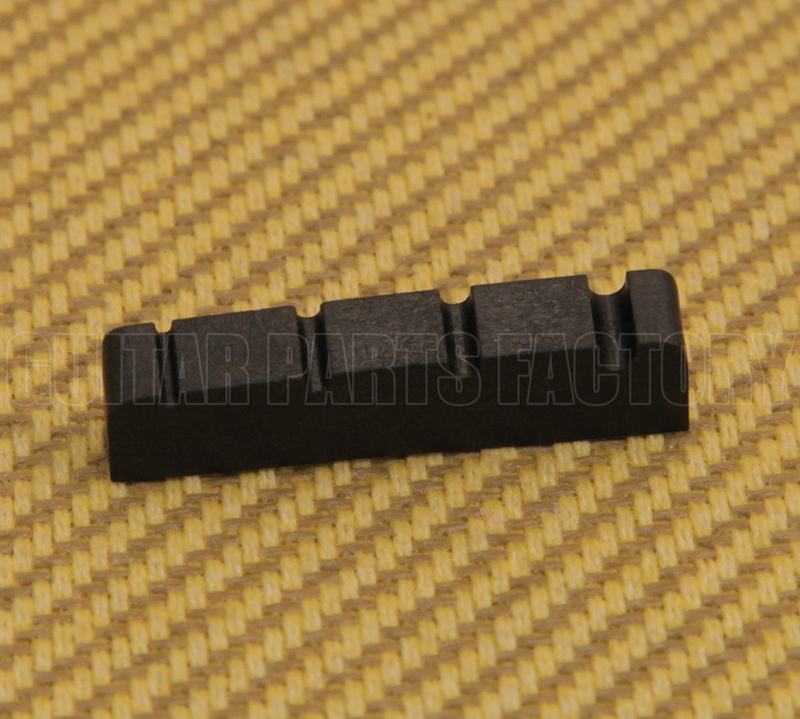 Measures 1 3/4 inch (45mm) x 1/8 inch (3.5mm) x 7/32 inch (6mm). 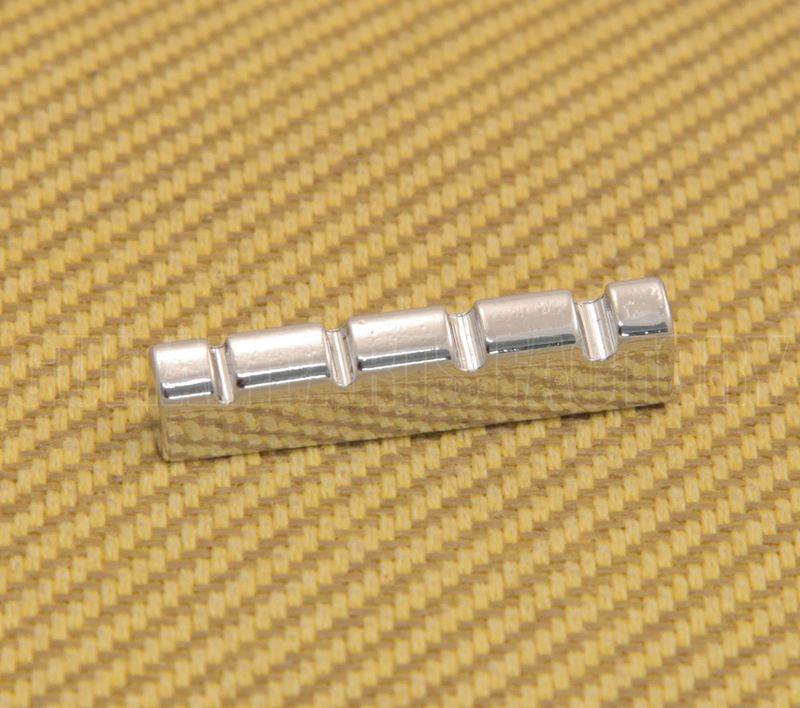 Pre-slotted white bone 5-string resonant bass nut. Measures 1 3/4 inch (45mm) x 1/8 inch (3.5mm) x 7/32 inch (6mm).